Meet some of Ireland’s most promising “social entrepreneurs” who were awarded for their work last night. 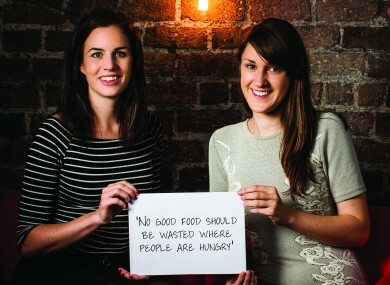 WHEN THEN-COLLEGE STUDENTS Iseult Ward and Aoibheann O’Brien decided to find out what happened to all the unwanted food from stores and eateries across the country, they were stunned at what they discovered. About a million tons was going to waste each year because there was almost no-one connecting those outlets with the charities that needed food for the homeless or people living in poverty. “It was kind of shocking to realise that Ireland was so far behind, considering that we have such a rich heritage in food and agriculture, that we don’t really have anything in place,” Ward, 24, told TheJournal.ie. Together the pair founded social enterprise FoodCloud to connect those who had produce to spare with organisations that needed food through an app to streamline the process. Last night FoodCloud was among 9 organisations recognised at the annual Social Entrepreneurs Ireland awards, where the duo was given a €140,000 prize for their not-for-profit. From starting off with one Tesco store and a few Dublin cafes and bakeries a year ago, their enterprise has swelled to nearly 100 businesses and 220 charities covering 18 counties across Ireland. Over a ton of food is now shifted via the app every day and about 148 tons has been moved so far – enough to make 325,000 meals. The next step for FoodCloud, with the help of the latest funding boost, will be to enlist more charities and roll their app out across Ireland and potentially expand into the UK, Ward said. Two other organisations, Virtual Community College and special-needs charity Sensational Kids, also took away prizes worth €140,000 at the awards. Social Entrepreneurs Ireland chief executive Darren Ryan said all the organisations recognised last night were still in their early stages and were picked because they brought a new approach to “solving some big problems”. “With the right supports, they have the potential to address a real need in Irish society,” he said. Over 10 years, Social Entrepreneurs Ireland, itself a charity, has supported 179 social entrepreneurs and invested a total of €5.82 million in their projects. Email “How two students saved enough food for 325,000 meals from the rubbish”. Feedback on “How two students saved enough food for 325,000 meals from the rubbish”.